Latin and Greek lessons are not on the timetable in every school. However, following a discussion between language teachers at Bedford Academy and Bedford School, we are delighted that a group of high-ability Year 8 pupils from Bedford Academy will visit us fortnightly on Monday after school to learn some Latin and Greek as well as build an understanding of Greek and Roman culture. 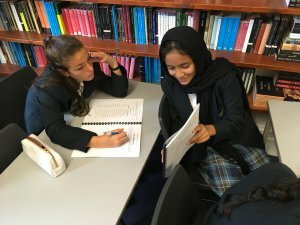 Their first lesson was taught by Head of Languages, Mr Alistair Melvill, who gave the pupils an introduction and explained the importance of studying Greek and Latin. The pupils, comprising of ten girls and two boys, then received a rudimentary overview of Greek. Two Bedford School Lower Sixth pupils, Will Ashcroft and Oscar Hill, were also on hand to help deliver the lesson, and over time, are looking forward to running the lessons with minimal guidance from Mr Melvill, to give them the opportunity to try their hand at teaching. The Bedford Academy pupils are already looking forward to their next session when they will start to look at the two languages in more detail.